You don’t need a big space to enjoy gardening – whether you have a large back garden or a small window box, there’s lots you can do to make the most of your outdoor area. Urban gardens can be made into the perfect haven to escape to after a busy day working in the city. Here’s a few ideas for how you can make the most of them. Paving is a great addition to any garden, and it doesn’t have to be a grey, empty space. It provides the perfect surface for some pretty garden furniture – think of antique, metal tables and adorable vintage umbrellas. They’ll create the perfect spot to have your morning cup of coffee – contact a Garden Paving Supplier to find the ideal paving for you. 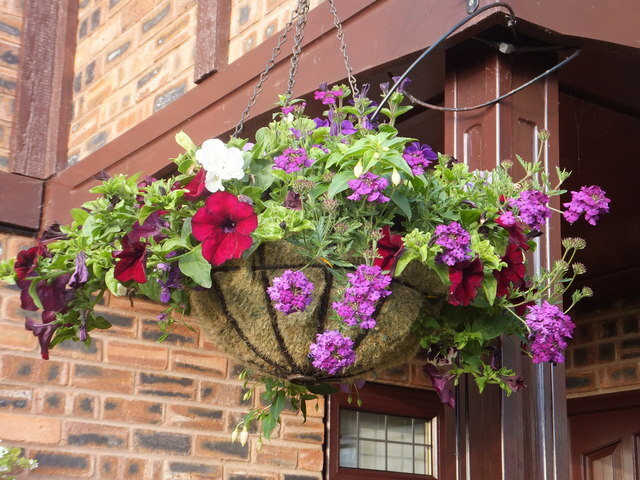 Hanging baskets provide a dash of colour and will attract a host of beautiful wildlife, including bumblebees and butterflies – with minimal maintenance. All you need to do is water them regularly to ensure the plants are healthy and beautiful. If hanging baskets aren’t quite to your taste, consider window boxes. These take up even less room and can be easily watered from inside of your home – try filling them with fresh herbs such as parsley, thyme, mint and rosemary. Herbs will make your garden smell beautiful and will also save you money. Different pot designs can add a quaint touch to a vintage style garden, or why not buy your own pots and paint them yourself? You might not be able to extend your garden, but you can certainly make it appear bigger. Hang vintage mirrors across your fencing to create the illusion of a larger space. Make sure you face them away from direct sunlight, or you might end up squinting every time you look outside. Climber plants are great for smaller spaces – growing upwards rather than outwards. Consider plants such as ivy, wisteria and Jasmine which will climb up your exterior walls or fences once planted and give a brilliantly traditional look to your home. Flowering climbers are great for summer and will add colour to your home from the outside. Previous Post Autumn is coming – is your garden ready? I think you’re absolutely right about creating illusions, I hadn’t thought of mirrors or smaller scale elements like that but it’s a great idea for a smaller space and definitely a tip I’ll be using. For small spaces I think that the best thing is to use something create layers or sections, pergolas and arches work really well like frames (http://www.harrodhorticultural.com/garden-arches-cid219.html) that you can grow over giving the illusion of open spaces through small gaps and arches as people don’t really know how much it opens up. If texture or raised/dropped levels can be added in a creative way the other side of the archway then that can make the space feel larger than it is adding to the illusion you’ve created.